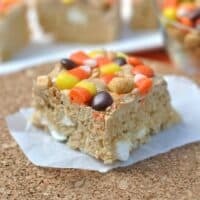 Chewy Peanut Butter Krispie treats topped with Candy Corn, Peanuts, and Reese’s Pieces. So yesterday I shared with you a quick and easy Brownie/Cookie recipe (BROOKIES). You know, the kind you can whip together in case your kids sign you up for a holiday party. Today, why don’t your reward yourself with a batch of Krispie treats. Anyone else LOVE Payday Candy bars? 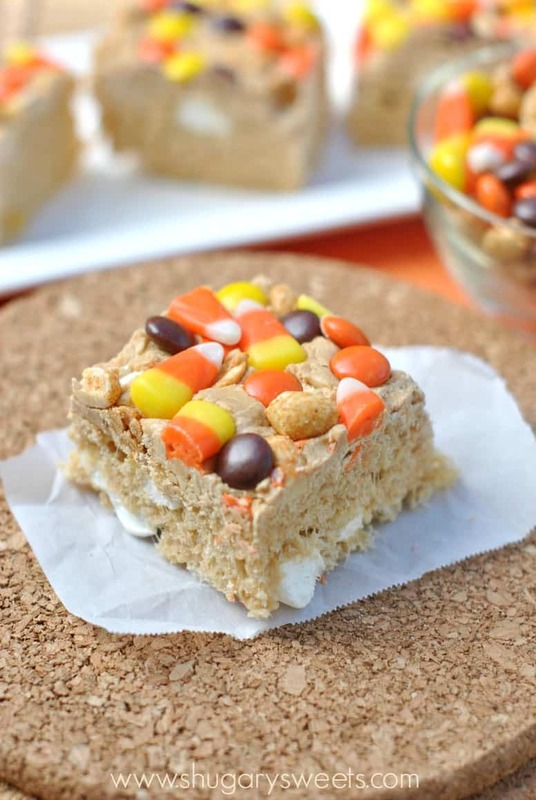 These Krispie treats are inspired by one of my favorite candies. The salty peanuts with the chewy marshmallow krispie treats alone is rewarding. But then you add on some candy corn, peanuts and Reese’s pieces, and this is definitely a PayDay dessert! Speaking of “paydays”, I calculated today that there are only 4 more paychecks until Christmas. Usually by now I have done SOME shopping for the holidays. So far, I have nothing. Yikes! When is it too soon to start on the Christmas recipes? I guess I need to work on Thanksgiving first? Yes? Little did you know I’m already playing Christmas music. For now though, enjoy some Payday inspired Krispie treats! 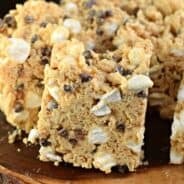 Need to know how to make Rice Krispie Treats? 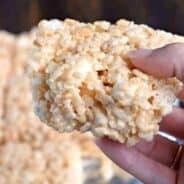 I’ve got plenty of recipes for you to practice with, including my Perfect Rice Krispie Treats and Fluffernutter Rice Krispie Treats! 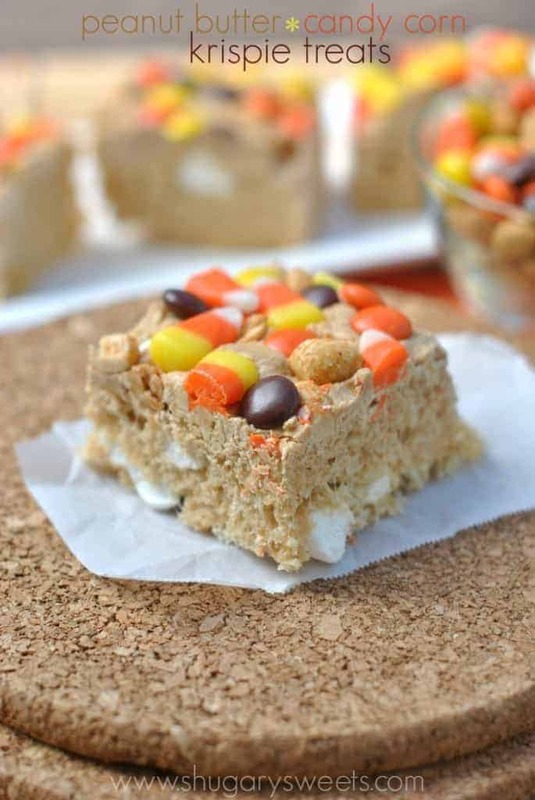 Chewy Peanut Butter Krispie treats topped with Candy Corn, Peanuts, and Reese's Pieces. Line a 9inch square baking dish with parchment paper and set aside. In a large pot, melt butter over medium heat. Add marshmallows and turn to low heat, stirring constantly until marshmallows are completely melted. Remove from heat and add peanut butter, stirring quickly. Add cereal and stir until combined. Fold in mini marshmallows. Pour krispie treats into baking dish. Using the butter wrapper (or lightly buttered fingers), gently press the krispies into the pan. DO NOT OVER PRESS, this will lead to dry treats. Top the treats with the melted peanut butter morsels. 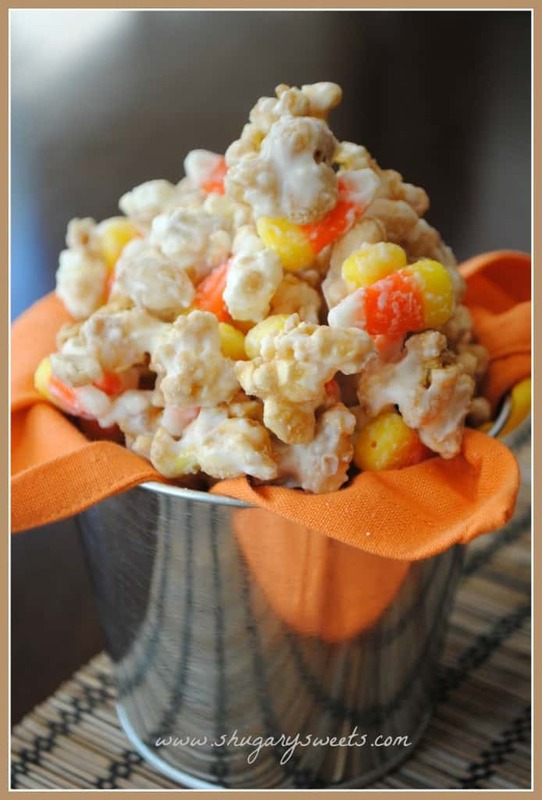 Sprinkle with candy, peanuts and candy corn. Press those into the melted peanut butter. Cover with foil. Allow to set, about 30 minutes. Remove from pan, remove parchment paper, and cut into squares. Store in an airtight container at room temperature for 2-3 days. ENJOY. 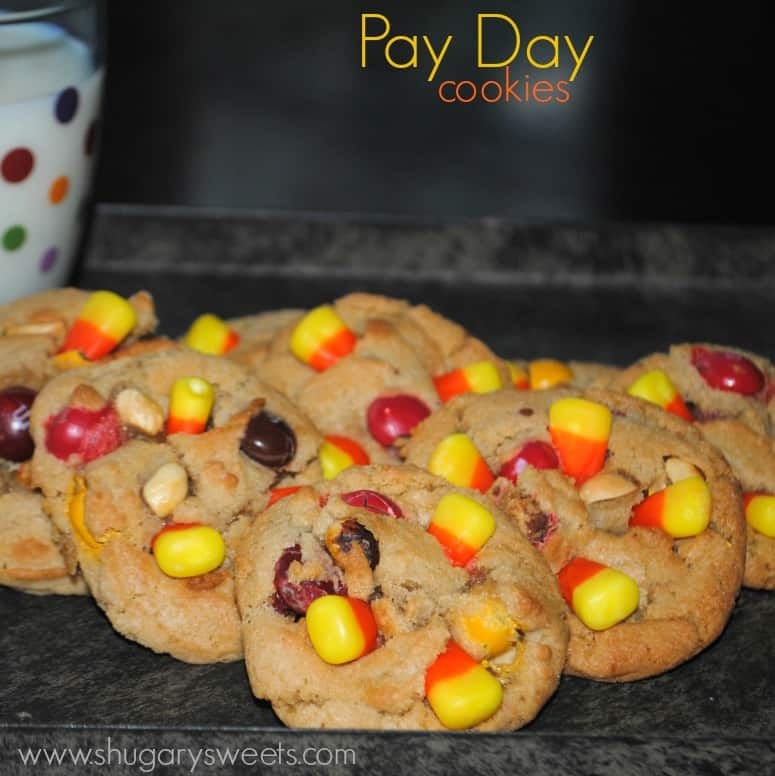 Looking for more PAYDAY inspired treats? ADORABLE krispie treats + pb=yummy!!!! Now that’s the kind of math I enjoy Kayle! 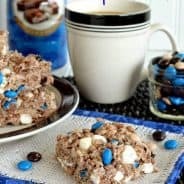 I could go for a rice Krispy treat snack right about now! This looks delish! Love this combination, Aimee! These look so fun and delicious. I love all the flavors in these Rice Krispie Treats. I used to listen to Christmas music this early, but this year I’m trying to wait just a little longer. It keeps me from pulling out the decorations too early!! I can do any of the “snowy” songs yet…not ready for WHITE. Yeah, it’s a great combo of flavors in one bite! Since I crave something salty or sweet every single day, a pan of these treats would go very, very quickly! We need to get together for lunch, I’ll bring the sandwiches you bring the treats! Peanut butter rice krispies with my new favorite snack mix…yup, I’m lovin’ it!!!! Leftovers? On Krispie Treats? Do you even know me at all…hehehehe!!!! Ooh, love these photos and LOVE this flavor combo! 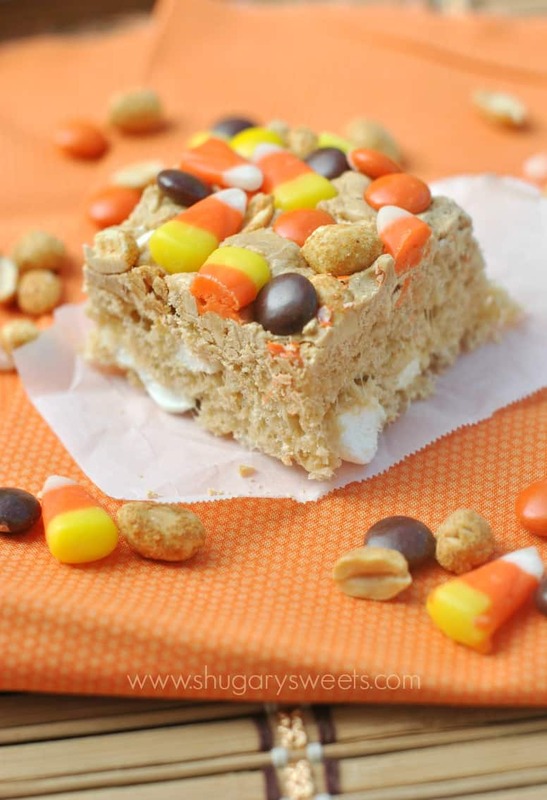 Pb and candy corn is the perfect Halloween bar! What fun krispie treats! Love all the flavors and textures! I have not made crispie treats in for ever. I know the last time I did though it had tons of peanut butter 🙂 That caramel corn looks fantastic!! Can your recipes BE any more amazing?! I think not! I LOVE the combination of honey roasted peanuts and candy corn ever since you gals told me about it last year! Obsessed. I need these puffy marshmallow treats in my life! These look amazing!! Love the peanut butter addition. Thanks Jamielyn! They’re truly addicting! These look great! I tried making my own Candy Corn Rice Krispie Treats, but wasn’t happy with how they turned out. Will definitely have to try yours, instead! I have a feeling the PB would help to cut the extra sweetness from the candy corn! You’re killing me with this, it looks SO tempting 😉 I love candy corn and reeses pieces!!! Pingback: 10 Delicious & Different Ways To Cook With Cereal!